If a yacht is the ultimate status symbol, then the owners of these are at the top of the heap. These floating palaces are super-sized, stunning and packed with a whole new world of over-the-top amenities. 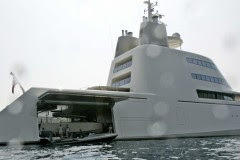 “To have a swimming pool, helicopter pad—that’s de rigeur,” notes Jill Bobrow, author of the book Outrageous Yachts and editor-at-large for Yachts International Magazine. From multiple helicopter landing pads to escape submarines, these floating palaces are super-sized, stunning and packed with a whole new world of over-the-top amenities. One of the world’s largest private sailboats—built for venture capitalist Tony Perkins but now owned by hedge-fund superstar Elena Ambrosiadou—the 289-foot beauty is best known for its revolutionary DynaRig sailing system: a square rig with three self-standing and rotating masts hosting 15 computer-operated sails totaling 25,791 square feet. That means extreme aerodynamic efficiency and speed; the Falcon can cross the Atlantic in ten days. And its quarters, naturally, ooze opulence. A stunning circular stairway shoots through a light-filled atrium to unite three decks with transparent floors, while other touches include a full gym, massive works of art, staterooms for up to a dozen guests, a VIP suite with private cockpit, a black-leather–floored dining room with a skylight blind that opens like a camera’s iris aperture, and a loungey main saloon in which a porcelain Bugatti emerges from the central table with the touch of a button. 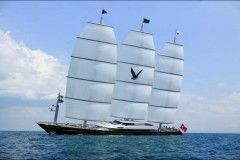 For extra fun, the Maltese Falcon carries plenty of water toys: two 32-foot Pascoe tenders with water skis, four Laser sailboats, six sets of dive gear and a 14-foot Castoldi Jet tender. Greek billionaire Dakis Joannou, one of the biggest collectors of contemporary art in the world, is the man behind this hard-to-miss 114-foot vessel by Italian yacht builder Ivana Porfiri. 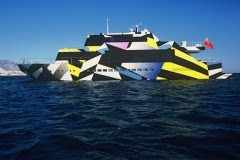 Its flashy exterior—a WWI-inspired camouflage pattern in bold yellow, purple, black, white and blue—was designed by superstar Jeff Koons. The bright, mostly-white interior (featuring white Corian flooring and floor-to-ceiling windows) brims with artworks including a wall painting by David Shrigley, a neon “Feelings” sculpture by Martin Creed, and, in the VIP suite, a bright-red “Guilty” painting by Sarah Morris. This 197-foot pleasure cruiser—which Sean “P. Diddy” Combs and his family recently chartered for $850,000 a week through the Luxury Yacht Group firm—is chock full of regal amenities. But its coolest draw is technological: It’s got a custom-made (and customizable) iPad app that allows passengers to control everything from the entertainment and climate systems to blinds and lights in their cabins through a mere tap on their touch-screens (14 iPads are available onboard). Other perks include a slew of Jacuzzis and flat-screen LCD panels, an aromatherapy shower, and an outdoor gym that converts to a disco with an $80,000 light-and-sound system; among the toys are an inflatable floating trampoline, three remote-control racing sloops, waterskis in various sizes and Sea Bobs that let you zoom through the surf like a motor-powered dolphin. Designed by Philippe Starck, this 394-foot stunner looks more like a futuristic submarine than a standard megayacht. Owner Andrey Melnichenko, a Russian banking-coal-fertilizer mogul, had it built for $300 million, and spared no expense in outfitting its 23,600 square feet of living space. Over-the-top details include a spiral staircase with a $60,000 banister, $40,000-apiece bath knobs, Baccarat crystal tables, a tiny “nookie room” with a round bed and TV mounted on the ceiling, and a panoply of decorative animal skins—including a room wallpapered with white-stingray hides and a pair of chairs made from alligator skins and kudu (African antelope) horns. A door at the rear opens to become a $25-million swim deck. Perhaps most outrageous, though, is the level of security onboard: The boat’s anti-intruder system includes 44 security cameras and a dozen exterior cameras with motion-detection and night-vision infrared. And a 2,583-square-foot master bedroom (with rotating king-size bed), accessible only through a fingerprint security system, is wrapped in bombproof 44-mm glass. Ice, owned by Russian billionaire investor Suleiman Kerimov makes the list for being unexpectedly progressive: She is the first “green” megayacht on the open seas. In addition to being stocked with plenty of over-the-top amenities—large swimming pool, gymnasium, sundeck with Jacuzzi, sushi bar, baths carved from limestone blocks, minimalist design by Terence Disdale, exposed-oak floors, major art collection, helipad—this 295-footer has reduced noise, vibration and pollution thanks to an alternative propulsion technology called Azipod. The system is powered by eight electric generators that replace the two large main engines typically found on a yacht of this size. Any exhaust that is produced by the boat passes through a soot-removal filter before expulsion, and there is a wastewater management system on board.